1. The Choosing and Treatment of the Original Layer Materials. The layer materials Boletus of the Steppes needs is the same with what other edible fungus need. The main components are sawdust, deal wood bits, fungus lawn powder, cottonseed shell, wheat shell, cane sugar, calcium carbonate. And plastic bags are needed. The sawdust should come form the broad leaf woods with soft texture which belong to the fifth or the sixth species. Such as maple, alder, like that. It is easier for the mycelial to decompose them, and can lead to a high yield. Otherwise, the using of the hard board leaf woods, such as robur,this kind of woods, will make the spread of the fungus slow and the output low. The fine and coarseness of the bits also effects. If the bits is too fine, it will cumber the spread of the fungus. But if the bits are too coarse, although the spread will be faster, it is harder for the mycelia to decompose and absorb the nutrition and finally affects the output. The best choice will be the bits between 2 and 4 millimeter. After cutting up the woods, the bits should be piled and watered for about 30 days. After that, dry up the bits. Fungus lawn fowder can be made form weeds of Miscauthus floridulus Warb, Saccharum arundinaceum Retz, Neyraudia reynaudina Keng, bulrush and etc., or from the man-planted weeds of Pennisetum Purpureum Schumach, cornstalk, broomcorn stem. The muller’s griddle should be between 4 and 6 millimeter. The cottonseed shells should be those with short or medium-long hairs and without nucleus. Wheat shells should be those red and thick ones. Then cane sugar can either be brown sugar or white sugar. The plastic bags should be of high pressure polyethylene or of low pressure polyethylene, and the length of 33-35 cm, the width of 17-18 cm, the thickness of 0.04-0.045 cm. 2. Seeds and Season Selecting. 2.1. The two ends of its fruit body are slightly small. And the pileus is flat, appearing like drumstick. The product is easy to preserve and not easy to deteriorate. 2.2. The stipe is thick and long. The pileus is big and bending upwards, looking like a funnel. Its fruit body is tenderer. After drying up, it could be excellent product. But the fresh is comparatively resisted to the preservation. These two kinds can be selected to plant according to the local markets’ demands. 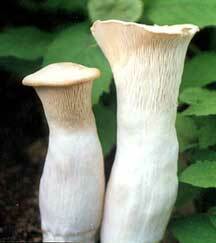 The up-mentioned two kind of Boletus of the Steppes should be raised in the temperature between 10-18°C. They are low temperature species. The planting season should count on the local temperature. The suitable time in my province will be: from the beginning of September to the end of the same month in high latitude areas; from last 20 days in September to the first 20 days in October in medium-low latitude areas. Boletus of the Steppes are planted in short plastic bags placing in indoor shelves or in sheds outdoors covered by soils or not. The output in the shed with soil covering is clearly higher than in indoor shelves. But the quality is poorer. What is more, the product’s water-contain rate is higher and it is not easy to preserve. 3.1. Sawdust 48%, cottonseed shell 22%, wheat shell 25%, corn powder 3%, white sugar 1%, calcium carbonate 1%; The materials to water proportion is 1:1.1-1.15; pH value 6.5-7.5. 3.2. Sawdust 45%, fungus lawn powder and pine sawdust 25%, wheat shell 25%, corn powder 3%, white sugar 1%, carbonic acid powder 1%; The materials to water proportion 1:1.5-1.15; pH value 6.5-7.5. After cottonseed being wetted, the materials to water proportion is 1:0.8-0.9. pH value is tested when mixing the materials. The processes of mixing, bagging and disinfections are the same with other edible fungi. The cottonseeds should be put into the limewater for 24 hours. This is to make the seeds sufficiently absorb the nutrition. The materials should be evenly mixed and water should be wholly distributed. Only so can make the nutrition even, and the fungi equally grow. The bagging should be tight and solid. Each bag can be filled with 0.45 kilogram dried materials or 1 kilogram wet ones. After bagging, make a hole of 5-6 cm deep and 1.5-2 cm wide in the middle part of each bag. It should be thorough. Under normal pressure, the disinfections temperature should be up to 100°C. If to disinfect 1000 bags at a time, make it at least last for 12 hrs. If 2000 bags, 14 hours. If 3000 bags, 16 hours. I should specially note that if we should use the Frame Box Steam disinfections Method that put those fungus bags in the frame boxes and then put these boxes in the disinfections pool. We should change the old way, which is to pile them up. And the new method can highly improve the Finished Fungus Bags Rate. 4. Disinfections, Vaccine Inoculation and Mycelia Fostering. To disinfect is to disinfect the fostering room, the inoculation boxes, the outdoor planting beds and the superstratum soil. If the wooden room is going to be the fostering room, it needs to be cleaned by limewater. After the room become dried again, cover the inside walls, floor and ceiling with plastic films. If it is a concrete room, we only need to do some cleaning and cover the doors and windows with plastic films and at last scatter some lime powders on the floor. After all this, we can start the disinfections. One day before we move the fungus bags into the room, smoke it by the formalin and potassium permanganate. The volume should be 7-milliliter formalin and 5-g potassium permanganate per cubic meter. After the smell of the chemicals is ventilated, we can now move the fungus bags onto the shelves in the room. It is more convenient to disinfect the inoculation boxes by aerosol disinfector. That is to smoke the boxes by the disinfector for 25 min. Each cubic meter needs a pack of 5-g disinfector. As to the farmland beds outdoors, to scatter 50-75 Kg lime powders on every 100 square meters. To the disinfections of superstratum soil (sand and soil or vegetable land soil), to mix every 50-Kg superstratum soil with 0.5 Kg lime powders and 2 g DDW. And it should be done 7 days before the soils are used. The day before it is used, we should expose them to ventilate the smell. In order to improve the finished fungus bags rate, we suggest inoculating in the inoculation boxes. Every one 750 milliliter jar inoculates 35-40 bags. After the fungus tubes are inoculated and are fixed with plastic rings or stuffed by cotton blocks, we should shake the bags several times, in order to scatter the fungus seeds on the surface of the superstratum soil and make some seeds fall onto the holes which are previously made. This action can both reduce the surface pollution of superstratum soil and promote the growth of the mycelia and the funguses. The best temperature for mycelia’s growth is from 22-25°C and the best humidity is 60%-65%. When the indoor temperature is up 25°C , we should frequently open the doors and the windows to ventilate. But when indoor temperature is below 18°C, we should reduce the ventilation times or ventilate once every two days. In proper temperature, mycelia can grow to the surface in 5 days. When the mycelia grow to the one third high of the plastic bag, the growth speed will slow down. Then we should pierce holes to give more oxygen supply. That is to use the nail to pierce one hole on every four sides of each bag. The height of the hole should of the similar height of colony and the depth should be 2.5-3 cm. After doing that the mycelia will clearly grow thicker, and the growth will be faster. It is helpful to improve the outputs. After 10 to 15 days of the full growth of the mycelia (mycelia filling the full bag), there will be cotton wool shape anlagen or 2-3 cm fruit body (some species do not have cotton wool shape anlagen). Then we can open the bags and make them out. When opening the bags we pull off plastic rings and cotton blocks and then fold down or cut off one third of the bag. At the same time, cover the exposed part with gauzes and water by atomizer. Gauzes can help maintain water and reduce the pollution, as well as keep the funguses regular. It should be widely used. Water Spraying and putting out the funguses is a very important technical. It should be given special attention. The frequency of water spraying depends on the weather: 4-5 times a day on sunny days, 2-3 times a day on cloudy days. Water spraying is to wet the whole gauze but without water dropping from it. The humidity of the room should be 90%-95%. If finding the bag growing green mildew, we should stopping spraying water immediately, and improve the ventilation. When fruit body grows to the size of the end of chopsticks, we can start to release the buds leaving on 2 or 3 in one bag. Doing this can improve the outputs and the quality. When fruit body grows to the size of the end of forefingers, gauzes can be taken away. And we can spray water directly onto the. The water spraying volume should be flexible to the weather and the growth. We should specially care the ventilation at the stage of funguses pulling out. And improper water spraying may cause lager areas pollution to the bags, and this may lead to great loss. This problem is what peasants often encounter in recent years. After 5-7 days of full mycelia’s full growth, we can now lay the funguses bags in soil beds on land, which are in shed outdoors. And cover the bags with soil. This is the process of putting out the funguses and covering with soil. Before covering with soil, we should cut off the surplus part of the bag, which is above substrates and lays the tubes of funguses closely. When covering the funguses bags with soil, which has been previously disinfected, make sure the soil should 1-2 cm high up the bags top. After 3-5 days, we can start to spray water on it. When pilei of Boletus of the Steppes open up and have some spore powder on them, it is time for collecting. To collect we spin them down. After spinning them down, we should promptly clean up the root remains and old fungus skins in the bags. Stop watering for 5-7 days to foster. After mycelia recover their growths, cover them with gauzes and spray water on them to wait for the second growth tide. The output of the first tide consists of 60%-70% of the total. And the products of the second tide are often of low output and poor quality. And the poor growth the first tide will also has negative effects on the second tide output. After collecting funguses, wipe out the roots and wood bits (those funguses growing in land, the roots and wood bit should be immediately wiped out when we collect them). And we should make the process, store, salting and sale quick.